Early this morning, the US Supreme Court issued a decision that is the latest in a long line of attacks against public workers’ wages, benefits, and voice on the job. In their Janus vs AFSCME ruling, the Court made it easier for anti-worker extremists to rig the economy further by dividing working people. And while the Court’s decision is disappointing, hundreds of SEIU 503 member leaders have been preparing for this outcome for a long time. They’ve talked with SEIU 503 members from every corner of the state who have committed to continuing to join together in union, no matter what any court says. As members of the union we can increase our pay and benefits and have more of a say in workplace conditions. 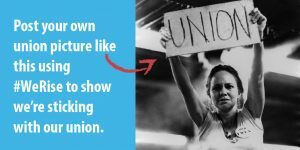 In states where more public employees remain members of the union, salaries are higher for all employees because the union has the power to negotiate from a position of strength. Our union has our back when we are falsely accused of something or wrongly terminated. SEIU is there for us when we expect it least and need it most, giving us a voice and a place to turn to when problems arise in the workplace. SEIU ensures that the rules at our job are enforced and we are treated fairly. The union ensures that your employer can’t make you work overtime without getting paid and that you get the wages you’ve earned. We’ve achieved major victories by standing unified In the last year alone, SEIU 503 leaders have secured $30 million additional funding for child welfare workers, made our highways safer for ODOT workers, and defeated more than 40 bills attacking PERS. Being a union member is, now as it always has been, a powerful choice. It’s a choice to join together for the respect we deserve, and the jobs our communities need. It’s a choice that only we can make—and that no court can take away.